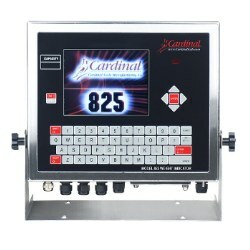 Cardinal Scale leads the weighing industry with their USA-made digital weight indicator product line. Cardinal’s weight indicators provide easy, convenient scale operation and accurate, reliable measurements. From basic truck scale weighing to complex process automation, Cardinal Scale has a weight indicator for your application. Cardinal Scale’s 825 Spectrum weight indicator can send automatic e-mail alerts through an Ethernet connection to the client’s internal SMTP e-mail server for submission to up to three recipients per scale. The 825 features up to 10 scale inputs per indicator by installing additional option cards to the multiple slots available, and each of the scales connected has completely-individual configuration for the e-mail alerts. Originally programmed for a company to use with a series of tank scales, this 825 custom application allows users to receive instant notification on stocking levels, such as when it’s time to order refills.